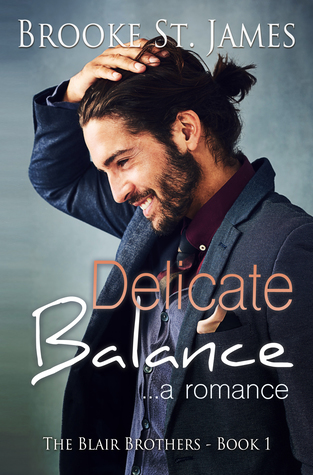 Delicate Balance: A Romance (2019) by Brooke St. James is the first book in her The Blair Brothers series. This book comes in eBook form, and is 190 pages in length. With a full-time job and a busy six-year old at home, this book took me less than 24 hours to devour! I purchased a copy of this novel from Amazon on April 3, 2019 to review. In no way has this influenced my opinion of the story. All opinions expressed in this review are my own. I give Delicate Balance 4.5 STARS. This book is a Contemporary Clean Romance. There were four boys in the Blair family, and all of them had that certain something. They were smart, athletic, funny, and gorgeous. If I was forced to pick my favorite, it would have to be Henry. He was the wild one of the bunch—a rock star. Literally. He left Astoria years ago to chase and realize his dreams in Seattle. I still saw his younger brothers quite a bit, but it had been years since I’d seen Henry. My plan last night was not to devour a novel in one sitting. But that is exactly what happened. Delicate Balance is ideal for when you want something super sweet, highly engaging, and fast-paced. It’s the perfect story to escape into, and I loved every page! Aiden is my kind of heroine. She is quiet, demure, and a bit of an introvert. The idea of doing new things sounds exciting to her, but she isn’t going to really do those new things. Instead, she is going to be a productive human in her society, and then go home to her dog every night to binge-watch Netflix or read a good book. If you added a husband and child to the picture, this would literally be my life. What I enjoyed so much about Aiden’s journey in this novel is that she finds someone who gets her to come out of her shell. Aiden’s problem is that she doesn’t see herself the way others do. She’s a really amazing woman, but she just can see it until Henry enters the picture and blows her preconceived notions about herself out of the water. I very much enjoyed seeing Aiden come into her own vis a vis Henry’s support. Every woman needs a Henry in her life who is able to help her realize just how awesome she truly is. What I really loved best about this story is how well St. James captures new love. The passion, the emotions, the inability to really say what you want or mean because you just don’t know each other’s cues yet. It was a fun trip down memory lane for me. I couldn’t help but think on the first few months of my relationship with my husband. That need to impress, but the fear of failure. Wanting so badly to be his one and only, but not wanting to be presumptuous. Looking back on it, new love is rough. I am so glad I am where I am with my husband today! I really feel St. James did a great job capturing the emotions of first love with Aiden and Henry. It really was so much fun to read their story and remember my own. Delicate Balance is the first novel that I’ve enjoyed by Brooke St. James, but it most definitely will not be my last. This book is so much fun! The characters are well written, the plot is highly engaging, and I very much enjoyed my trip down memory lane. If you are in the mood for a super sweet romance then I highly recommend Delicate Balance. I saw you twitter post with the cover of this one and had to immediately come find your blog about it. The cover got my attention immediately. Your review definitely makes me want to read it.